David Frampton of Majic Jungle Software has been hard at work porting his excellent Macintosh title Chopper to the iPhone in hopes of making it available on iTunes App Store launch day. 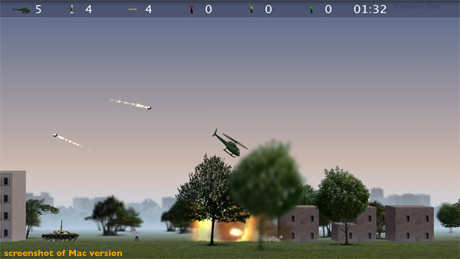 Chopper is a $15 shareware side-scrolling helicopter game in which you try to complete specific missions and return to base while avoiding enemy fire. A version is available for the Macintosh. Majic Jungle Software is working on porting this game over to the iPhone taking advantage of the iPhone’s accelerometer and 3D hardware. We’ve recently had the opportunity to engage in a little Q&A with David concerning this upcoming iPhone title. [Touch Arcade]: Thanks for talking with us, David. We’re big fans of the Mac version of Chopper. Can you tell us a little bit about how the port is going? [David Frampton]: Currently Chopper is nearly feature complete, with bug fixes, game play tweaks, sound, and a high scores system to go. Testers have been very positive, enjoying using the accelerometer to control the helicopter, and immediately and intuitively picking up how to play with the unique controls. [TA]: How did you implement the controls, and were there any challenges involved? [DF] The movement of the Chopper is controlled exclusively by tilting the iPhone forward and back, left and right. It actually means that unlike the desktop version it is possible to hover easily, and there is fine control over the amount of movement. I have found that due to a fairly narrow view angle it is best to keep the tilt required to fairly minor variations. This works well, however it means that you need to hold the iPhone at a fairly consistent angle. As a result, you couldn’t lie on you back and play it for instance. I plan to combat this by adding an in-game calibration feature that will allow you to easily set the angle at which you want the Chopper to hover in the center. The rocket is removed as a weapon to simplify the control interface, so there are two buttons for firing the gun and dropping bombs at the top of the screen. This way you can control the weapons without obscuring the action which normally occurs in the lower half of the screen. [TA]: Have you considered supporting the iControlPad? [DF]: The iControlPad looks like a neat add-on, and depending on its popularity and the API, I would definitely consider adding support for it. The game controls could very easily be mapped to such a control device for anyone who prefers that style of input. [TA]: Can you tell us a little bit about the rendering engine you’re using? [DF]: Chopper for the iPhone uses OpenGL ES to provide 3D graphics, and testers have been amazed at the visual quality the iPhone is able to produce. Load times are not noticeable, the frame rate is smooth, and the battery usage low. [TA]: Was it difficult to port the existing Mac rendering code, presumably OpenGL, to the iPhone with it’s more limited OpenGL ES API support? [DF]: I had no problems in adjusting to the new OpenGL ES API. As Chopper was originally written on a 350mhz G3 with a Rage128 It didn’t require shaders or any other specialized features. It was simply a matter of avoiding immediate mode, which was not difficult. For the iPhone I’ve used many of the same tricks to produce the likes of depth of field and time of day changes, but the iPhone version now uses a 3D projection which will allow a few extra graphical niceties not seen in the desktop version. [TA]: Sounds great! What framerate are you getting on the iPhone? [DF]: I have set the frame rate to 30fps. This looks fine and Chopper maintains this frame rate consistently. I’m not sure at this point what the display is capable of running at, but any higher and the battery usage would be higher which is a big consideration. [TA]: So we can look forward to playing Chopper for the iPhone on iTunes App Store launch day? [DF]: The unknown release date is making this a little tricky, but I’m still on target for the end of June. A price has not been decided on yet. [TA]: Thanks, Dave. We’re quite looking forward to this title. Chopper seems a game particularly well suited to the iPhone’s unique control scheme. Keep up the good work!